Sometimes the weather in New Zealand just isn’t fair! Hiking the Routeburn Track in rain and fog one day … beautiful sunshine for the drive from Glenorchy to Te Anau the next day … and then rain and clouds again the day after when we were driving into Milford Sound. This drive is supposed to be one of the most scenic roads in all of New Zealand … what they forgot to add is that it’s raining two out of three days in Fjordland and apparently we picked those two days for our visit. Seeing all this water cascading down the mountains certainly was a unique view, but it would have been nice to actually see the Milford Sound instead of just some shadows in the grey clouds. So after a 10 minute walk in the rain and a hot coffee to warm up afterwards there was not much else to do and we returned back to Te Anau where the sun was shining again – hmpf! Oh, I almost forgot to mention that I ran over a water faucets at our camp ground in Te Anau that morning to even the score with Bea’s hawk encounter 😉 When we rushed to the office to report that half the camp ground is about to be flooded by a gushing water geyser they only replied that they are used to disasters like that and will have a look sometime. Ohhkayy … well our tent was still there when returned in the evening so apparently they did fix the pipe on time. 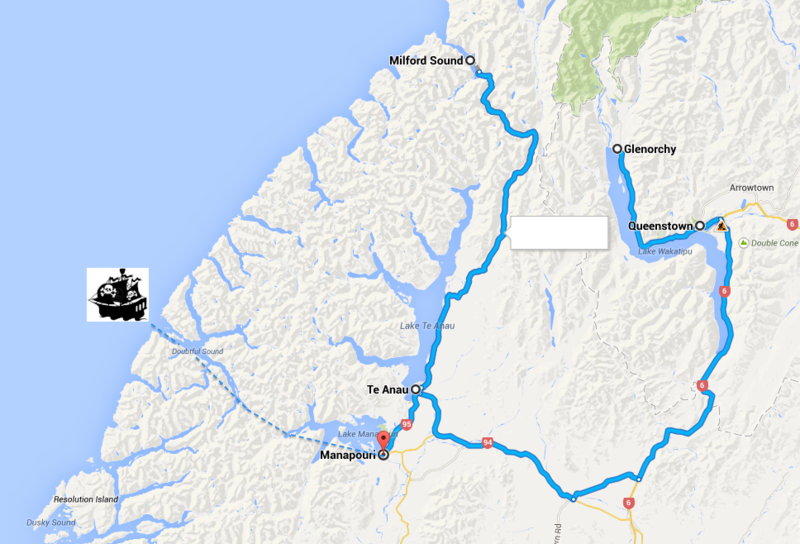 The next morning we drove to Manapouri where we had booked an overnight boat cruise for Doubtful Sound. Well first it was a 45 minute ferry ride across Lake Manapouri to Manapouri power station, New Zealand’s largest hydro power station built over 100m below water level into the mountain. Then we took another one hour bus tour over Wilmot Pass before we finally went aboard the Fjordland Navigator that would take us out into the sound. The shared 4-bed bunk cabins were surprisingly neat and spacious … the two guys we were sharing it with could have been a bit more fun though. Back on deck we enjoyed the scenic cruise, always hoping to spot some of the rare bottlenose dolphins in the dark brown water of the sound. This dark water is very unique to New Zealand’s fjordland were a layer of 5-10 meters of rain water, brown from plant sediment and filtering out most sunlight, sits atop a deep layer of cold saltwater creating an environment that resembles deep sea conditions. Despite the cold weather we joined the kayak excursion into the sound – which was a lucky choice because the guys in the rubber dinghies were apparently eaten alive by sandflies and we hardly had any. Our skipper brought us all the way to the mouth of the fjord where seals were lazing on the rocks and some fairly decent waves were crushing against the coast. Too bad it was cloudy and we missed the sunset in this beautiful location. The amazing dinner buffet that followed definitely made up for the sunset and we had a fun evening with Tom and Charlotte from England at our table. Who can count all the seals??? In the morning the Fjordland Navigator sailed into one of the side arms of the sound for a one-minute “Sound of Silence” where all machines were stopped until all water ripples disappeared and everybody had to be really quiet – how very peaceful! Sadly we did not see any dolphins on the way back either, but the nature guide on board did spot some tiny blue penguins faaar faaar away (then again she probably could have told us whatever she wanted about these distant ripples in the water if she wanted). Back on land the bus brought us back over the hill to Manapouri power station and the ferry took us to sunny Manapouri. Why couldn’t we have that kind of sunshine in Doubtful Sound?